A fake clinic (sometimes known as a Crisis Pregnancy Center) is a facility set up by abortion opponents whose goal is to provide biased, anti-abortion counseling in the effort to discourage women who are or think they may be pregnant from having abortions. With names that sound like real women’s health clinics, exam rooms with medical equipment, and workers wearing medical scrubs or white coats, fake clinics mislead people into thinking they are real full-service reproductive health care providers. But they are often not licensed to provide any medical care or, at most, provide very limited medical services. Fake clinics do not counsel pregnant women about all of their options – they actively counsel women against abortion often using false or misleading information. They do not provide abortion or contraceptive care, prenatal care or emergency contraception, nor do they refer patients for that care elsewhere. The appearance of a licensed medical facility can be determined by: medical attire, examination tables, medical supplies and/or medical instruments, the collection of health insurance information and co-location with legitimate medical facilities. What Tactics Do Fake Clinics Use? Fake clinics use dishonesty and deception to pull women into their doors and prevent them from choosing to have an abortion. They are often intentionally located near full-service medical clinics that do offer abortion services in order to confuse patients. This practice is called “co-location” — placing clinics next door, across the street, or even in the same building as an abortion clinic. They will often take it one step further by having a name that is intentionally similar to the real clinic’s name. They attract patients by offering free services (like pregnancy tests and sonograms) and financial support through pregnancy. They then commonly use medically inaccurate information about abortion, as a scare tactic. How Many Fake Clinics Are There? With more than 2,700 locations across the US, fake clinics significantly outnumber health-care clinics that provide abortion services, which number under 2,000. Fake clinics are in every state, in both rural and urban areas. Their focus, though, is on low-income areas where health services are particularly needed. Even in New York City, there are nearly as many of these fake clinics as there are actual reproductive health care facilities that provide abortions. Who Pays For Fake Clinics? The largest source of money for fake clinics comes from private donors, anti-choice groups, and religious groups. Often fake clinics are connected with large financial support networks that help with fundraising. thirty-four (34) States use taxpayer money to support fake clinics. New York State does not fund fake clinics but, in NYC, some elected officials have used discretionary funds for fake clinics. In NYC, several fake clinics are a part of Expectant Mothers Care (EMC), a network that funds and provides organized support for individual clinics. What Laws Protect Me From Fake Clinics? 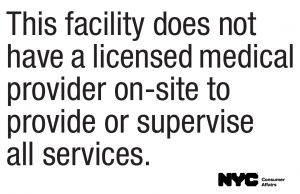 Under Local Law 17 of 2011, fake clinics in New York City must post signage indicating that they do not have a licensed medical provider supervising all services on site. This disclosure must also be included on all advertising and in conversation with clients in person and on the phone. Additionally, the law includes privacy protections for clients, so that a fake clinic cannot legally share women’s personal information with anyone. Fake clinics in violation of the law are subject to fines by the Department of Consumer Affairs. Make a complaint of fake clinics that are engaging in deceptive practices in violation of Local Law 17 online or by calling 311. Record the complaint number that the city gives you and fill out our tracking form, so we can follow up with the city to ensure enforcement. 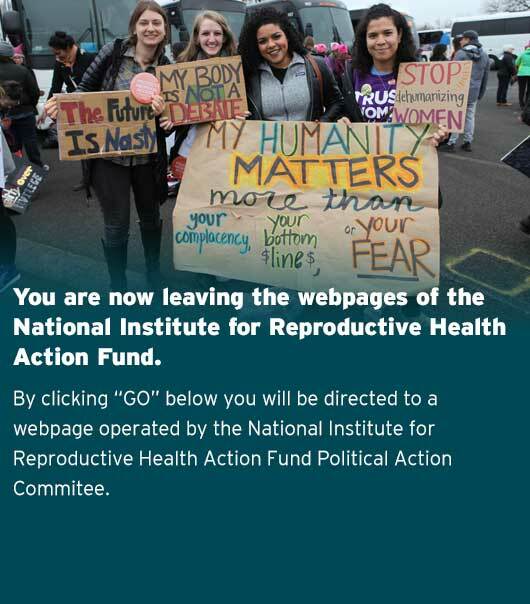 Donate to the NIRH Action Fund to support our work in building momentum to fight back against fake clinics in cities and states around the country. Spread the word! Share our Fake Clinic Fact Sheet on Facebook and Twitter.